Yakiudon is a Japanese noodle dish. 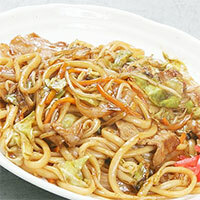 The noodles are thick and white, commonly prepared with meat and vegetables. According to the recipe or personal taste, different kinds of meat can be used, such as pork belly, chicken, or seafood. It is chopped into bite-sized cubes, and then stir fried. The vegetables included in this dish are shitake mushrooms, onion, cabbage, and carrots. It is seasoned with soy sauce and ginger. The noodles are added last, in order to avoid overcooking them. Yakiudon is not a bad choice for one on a diet, but depending on the type of meat used, it can be adjusted to the needs of dieting. The calories in Yakiudon per 360.9g(1 plate) is 415 calories. Yakiudon is calculated to be 115Cal per 100 grams making 80Cal equivalent to 69.57g with 60.05g of mostly carbohydrates、13.32g of protein、11.84g of fat in 360.9g while being rich in vitamins and minerals such as Vitamin K and Molybdenum.